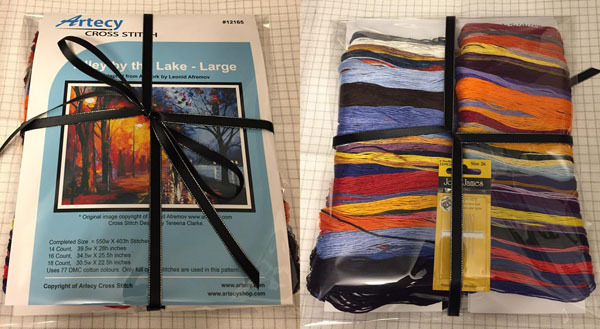 We are thrilled to announce we are collaborating with Nikki Northup the wonderful Canadian Designer and owner of Charting Creations to offer you custom assembled full Artecy kits, floss and fabric packs or floss packs for our Artecy Designs. You can also just order any of our printed patterns from them directly and not have to wait for the long postage time from Australia. This will be wonderful news especially for the vast majority of our customers who are in the USA or Canada. International customers will also be happy as they have a flat rate worldwide postage, (USA $6, Canada $5, UK $7, rest of world is $9) and no VAT to the UK charged either. If for any reason your shipping comes up cheaper (like for a small floss pack) they will refund any overpayment. Charting Creations will have full access to all of our designs, if they do not have one of our printed patterns in stock as yet feel free to contact Nikki on their website here Charting Creations Contact Us Page and she will be able to assist you. For a custom quote on a kit or materials that are not already listed on their website please go to this page Charting Creations Custom Quote Page for Kits or Materials As kits or materials packs are added to their website we will also link directly from the patterns on our website too. Besides being a retailer of Artecy Designs Nikki also stocks a wonderful range of kits and patterns from many Designers including her own Charting Creation designs and she also stocks a large range of fabrics, cottons and accesories. The kits are beautifully assembled with your choice or fabric count and the cottons are threaded on symbol cards which makes it very handy to not have to keep referring to the symbol list pages on the pattern all the time. If a kit is already listed use the drop down box to see the prices per fabric count, if you would prefer different fabric in your kit than is listed you can check the available fabrics stocked by charting creations here Charting Creations Fabrics and request a custom quote with your choice of fabric here Charting Creations Custom Quote Page for Kits or Materials and Nikki will be able to confirm if the fabric is available and the adjusted price for the Kit. Kits are usually posted out within 15 days of ordering, there may be short delays in peak times such as Christmas. If you have already purchased your pattern separately either as a pdf download or printed pattern on our website or through one of our retailers and you are just wanting the materials Charting Creations can supply the fabric and floss or just the floss pack, if you already have the fabric, to go along with any of our designs. Best of all by buying the floss packs they are usually cheaper than if you would have to purchase all of the Skeins of floss individually and you have the added bonus of having the threads already sorted onto easy to read symbol cards. If you search for one of our designs on their website and the Kit/Materials are not listed, for a custom quote on a kit or materials please go to this page Charting Creations Custom Quote Page for Kits or Materials and let Nikki know which pattern you are stitching and the fabric count and if you need fabric and floss or just floss and she will get back to you with a quote.